Chautala indicated that AAP could be onboard among the like-minded parties, while some smaller outfits could also be among those to extend support to the JJP. 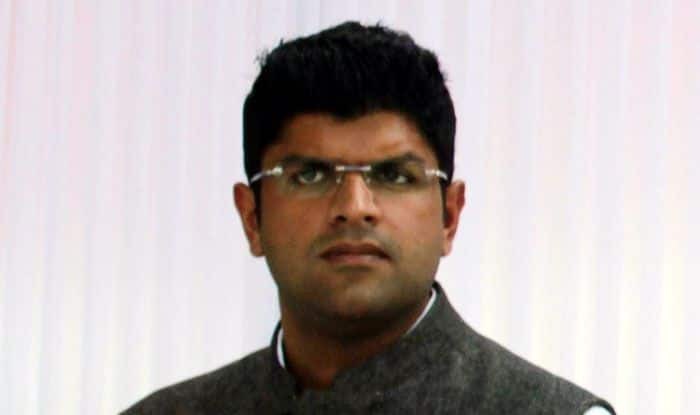 Jannayak Janata Party leader Dushyant Chautala on Wednesday said his party is in the process of forging an alliance with “like-minded outfits” to contest the Lok Sabha polls and an announcement in this regard will be made within four days. The Hisar MP said a three-member panel of JJP that includes KC Bangar, SS Kadian and state unit chief Nishan Singh has prepared a report which will be discussed with party patron Ajay Chautala, who will take a final call on the tie-up issue. He indicated that the Aam Aadmi Party could be onboard among the like-minded parties, while some smaller outfits, who may not put up candidates to fight the Lok Sabha polls, could also be among those to extend support to the JJP. Dushyant Chautala said only one member from his family will be contesting the general election. His mother Naina Chautala is a sitting MLA from Haryana, brother Digvijay Chautala recently fought the Jind by-poll and finished first runner up, while father Ajay Chautala, a former MP, is serving a jail sentence in connection with a teachers recruitment scam in the state. “Within four days, we will come out with details and make an announcement. We are ready to have like-minded parties and groups on board,” he said in Chandigarh. Replying to a question, Dushyant Chautala asserted that if AAP enters into any tie-up with the Congress in Haryana for the Lok Sabha polls, in that scenario possibility of having any understanding with Arvind Kejriwal’s party will end. “Our fight has been against Congress’ policies, our ideology also does not go with them,” he said. Dushyant Chautala hit out at the BJP-led governments at the Centre and in Haryana, alleging they had failed to keep the promises made to the people. “The BJP poll manifesto does not talk about what happened to the tall promises made to youth on giving jobs… Likewise, the Khattar government gave just 37,000 jobs in four years,” he claimed. He said the BJP has seven Lok Sabha MPs from the state but wondered what has been their performance. “People want to get rid of the BJP and they don’t want Congress to come to power again. The only viable option they find is the JJP. Our primary focus is to have a change in the state and that can come by getting like-minded people onboard,” he said, adding the vision document of his party is being prepared and will be released soon. “We will have a vision for each Lok Sabha seat, like what I have done in Hisar. Those are the things that we need to move forward for the whole state,” he said. He accused the BJP of dividing people on the basis of caste lines. “However, people now have seen through the games they play. People are no longer going to vote on caste lines, they want somebody educated to lead them,” he said. Asked if he seeks re-election from Hisar, Dushyant Chautala said the party will take a final decision. The JJP came into existence in December 2018 after the Indian National Lok Dal (INLD), a party founded by former deputy prime minister Devi Lal, split in 2018 after a bitter power struggle between his two grandsons– Abhay Chautala and Ajay Chautala. Meanwhile, Dushyant Chautala said Naina Chautala, Prithi Singh, Rajdeep Phogat and Anoop Dhanak — who were elected as INLD members, but have been supporting JJP and attending their functions — have not yet formally taken up membership of the JJP. Abhay Chautala had recently sought disqualification of these four legislators on the ground that despite being elected as INLD members they were indulging in anti-party activities.